Yasser Arafat's nephew said Saturday his uncle may have died an "unnatural" death, a statement certain to renew speculation among Palestinians and in the rest of the Arab world, where many already believe the late leader was poisoned, despite Israel's repeated and vehement denials. Nasser al-Kidwa, who is also Palestinian envoy to the United Nations, made the comments after he handed over the 558-page medical dossier to Palestinian officials in Ramallah. 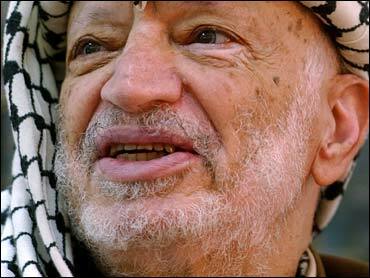 No diagnosis or reason has been given for Arafat's death on Nov. 11 at a French hospital. Al-Kidwa's remarks could cause fresh tension between Israel and the Palestinians at a time when it appeared relations were improving. By providing fuel for rumors that Arafat was poisoned, his comments could also make it more difficult for a new Palestinian leadership to take control after presidential elections on Jan. 9. But a decision on Saturday by Israel's dovish Labor Party to join Prime Minister Ariel Sharon's government could pave the way for Sharon to implement his Gaza withdrawal plan and restart peace talks with the Palestinians. After handing the 558-page medical dossier to interim Palestinian President Rauhi Fattouh, Al-Kidwa said French doctors could not rule out poisoning, but had not found traces in Arafat's body of "any poison known to them." "Examinations of X-rays and all imaginable tests ... are still with the same results, the inability of reaching a clear diagnosis," Al-Kidwa said in English during a news conference. "That is precisely the reason why suspicions are there, because without a reason you cannot escape the other possibility ... that there is unnatural cause for the death," he said. French officials have said that judicial authorities would have opened an investigation had they suspected foul play. Arafat, suffering from a mysterious illness, was urgently airlifted to the Percy Military Training Hospital in the southwestern Paris suburb of Clamart, on Oct. 29. His condition rapidly deteriorated and he fell into a coma. A month after Arafat's death at the age of 75, speculation still swirls about what killed him, with rumors ranging from cirrhosis of the liver, to AIDS, to poisoning. Hani Masri, a commentator for the Palestinian newspaper Al-Ayyam, said many Palestinians already believe their leader was poisoned, and Israel had made clear on many occasions that it wanted to rid the region of Arafat. "If there was proof he was poisoned it would severely complicate matters. The new leadership would not be able to renew peace negotiations with a country that killed its president," Masri said. Al-Kidwa and other Palestinian officials have said Israel contributed to Arafat's death by confining him to his battered West Bank compound for the last three years of his life. The nephew was given Arafat's dossier by French medical officials last month, but no details have been released. Palestinian Health Minister Jawad Tibi said a committee, including Palestinian and Arab doctors who treated Arafat before he was taken to France, would examine the file to see if it could settle on a cause of death. Al-Kidwa said Palestinian officials would pursue their investigation until they reached a clear conclusion, and vowed to make the diagnosis public. "This file should remain open until the Palestinian people find out the truth," he said. Meanwhile, Palestinians are focusing on the upcoming election. Tayeb Abdel-Rahim, secretary-general to the presidency, resigned Saturday to take on the post of campaign manager for PLO chief Mahmoud Abbas, a front-runner in the election. Abdel-Rahim, a leading member of the ruling Fatah movement, said he resigned because he could not remain a Palestinian Authority official while running Abbas' campaign as the Fatah candidate for president. According to recent polls, Abbas is about tied with jailed Palestinian uprising leader Marwan Barghouti, a Fatah member who is running as an independent. Palestinian officials visited Barghouti Friday in the Israeli prison where he is serving several life sentences for being involved in attacks on Israelis. Barghouti is under intense pressure from within the Fatah movement to withdraw his candidacy, and some officials said such a decision may be announced in the coming days. In Tel Aviv, Labor Party officials decided to accept Sharon's invitation to join his government, said Yoram Dori, an adviser to Labor leader Shimon Peres. Coalition negotiations were scheduled to begin later Saturday, he added. Sharon received approval from his hard-line Likud Party on Thursday to invite Labor into the government, a move that would bolster his chances of implementing his Gaza withdrawal plan. Sharon has also invited two religious parties to join the coalition. Opposition to the Gaza pullout plan cost Sharon his parliamentary majority earlier this year. Sharon must broaden his government to prevent an early election, which could delay — or derail — his plan to withdraw from all Gaza Strip and four West Bank settlements next year. Government officials have said Sharon wants to hold speedy negotiations and form a broad coalition in the next two weeks. Israeli media reported Sharon, 76, will offer Peres, 81, the post of deputy prime minister. Sharon and Peres have served together in past governments. Peres served as Sharon's foreign minister from 2001-2002. Since then, the two men have expressed a desire to work together again, but have largely been prevented from doing so by their own supporters.